All photos Rancho Reubdidoux, except right lowest, by Debra Lee Baldwin. As weeks go, this one was a big zero: I got nothing done (unless you think of napping as an activity). I won’t bore you with the reasons why; you already know them if you read this blog (yes — still!). So, this morning I sat up, rubbed my eyes and forced myself to think of 5 things I liked this week. You know, like when you click the little thumbs-up “like” button in Facebook. I figured this exercise would help me realize that I didn’t actually sleep the week away, and it would also help me appreciate those things, however small, that gave me pleasure. My first thought was: I got nuthin’! … then the fog lifted a little and I remembered that one thing I liked, then that other thing, then another, and soon I had to stop myself … I actually liked a ton of things this week. Here are my most photogenic likes of the week; I’m hoping you’ll like them, too! 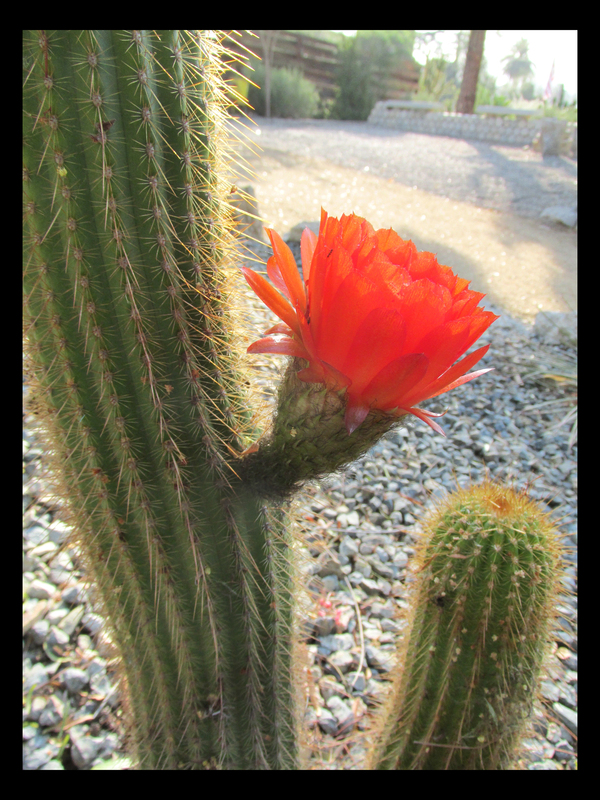 It caught my eye every time I passed it on my walk: a fully-loaded paintbrush of scarlet off the side of one of my cactus. I reminded myself daily to document it before it disappeared and I finally got around to it today. Impossibly bright with the morning sun behind it, this radiant cactus blossom was worth getting up early for. LIKE: Eye-opening color from a cactus that has never bloomed before now. When the city announced their intention to remove some ratty (literally rat-infested) ol’ pepper trees from behind our property, we were glad. They made us even happier by asking us what we preferred in their stead; we requested palo verdes. We’ve never regretted that request, especially in Spring. Not only are the PVs in explosive golden bloom right now, but they hum and buzz with the approval of everything from wasps to big-bellied bumblebees. 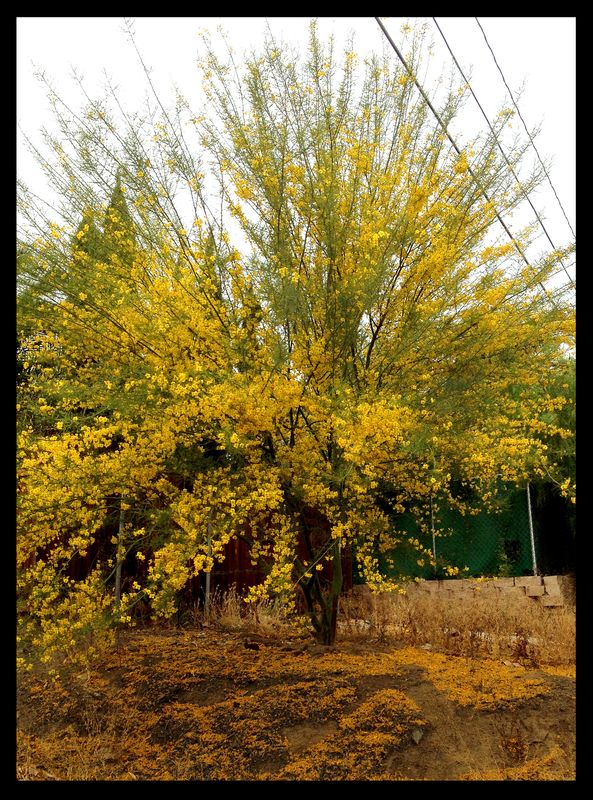 LIKE: Even when the blossoms inevitably fall they create a carpet the color of dried marigolds on the ground. When I’d finished watering the back property a couple weeks ago and was coiling the hose, I noticed a curious aggregation of twigs amongst the spiky leaves of a large aloe. It was getting dark so I finished the coiling and came inside … forgetting about the odd twig clot. This past Monday I remembered the clot and had a peek, finding a nest with three barely-fuzzed baby birds inside! They lay there, unmoving, until I touched the aloe’s leaves to take these pics; then they suddenly came to life, their beaks like bright yellow funnels gaping to be filled. I took my pictures and retreated in the hope that Mama Bird would return. She soon did, a smallish mockingbird full of buggy snacks for her babes. LIKE: I showed the nest and babies to our neighbor’s children and they loved seeing it. They were delighted, too, when I told them the babys’ names were Augusta, Marcus and Octavia … same as their own! This triple-spouted vase I found at a local estate sale; it’s really quite small and has a broken bit in the back, but I love faux bois and had to have it. 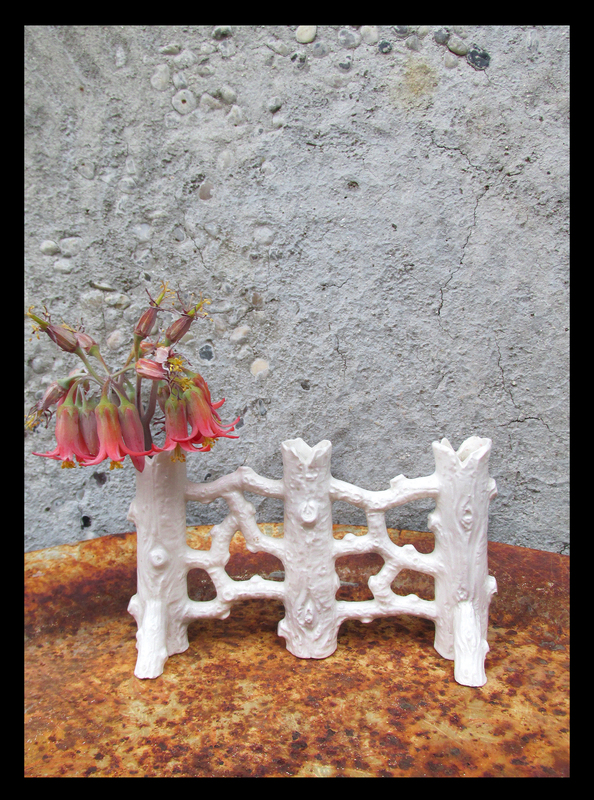 Like a small fence made of logs and branches, the vase will look good whether flower-filled or not. LIKE: I went to the estate sale with new youthful friends, and although I didn’t come away with much, it was fun hanging out. I found this awesome succulent globe on the blog, Gardening Gone Wild (click here). 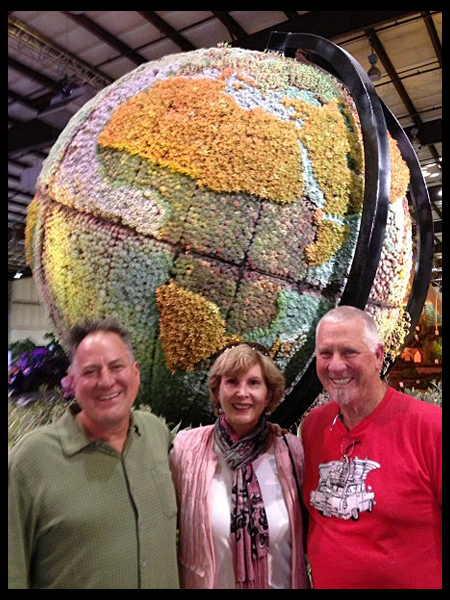 It was created by Robin Stockwell (red shirt above) of Succulent Gardens Nursery in Castroville, CA., and was the hit of the recent San Francisco Flower and Garden Show. Click the link above to read a piece on its creation by Debra Lee Baldwin (center above). By the way, Baldwin has a new book called, ‘Succulents Simplified: Growing, Designing, and Crafting with 100 Easy-Care Varieties’, out on Timber Press and I can’t wait to get it. It can be ordered by clicking here. Like: After looking at the pictures on GGW, l’m glad that I didn’t have to put in the work it took to create this amazing succulent creation — not sure I would’ve survived such an exacting task. Finding likes to like wasn’t that hard, really, once I got started. And it really felt good to share them. Feel free to leave a like of your own in the comments area; I like — make that love — hearing from you! As Tom says, “Are you looking inside my neck?”. I’ve been feeling quite a bit the same here lately. And have made trips around this mess of a yard purposely looking for something to help me smile. And, as you know, our plants rarely let us down. Thank you for this posting for you helped me walk back thru this week and find my smiles. Missing me? Sweet of you, Guida … not my best week by any means … I really needed this little exercise in “like”-ing. Thanks and hello to Danny! Yes, I was missing you…really…….wondering why we hadn’t heard from you lately…it had seemed like a long time…..be well my friend….a nap outside sometimes is good..
Lovely pictures, especially the ones with the little birds ! Sorry to hear you have healthproblems again ! I know all about how it feels but my garden is my lifeline, even on the days I can’t do anything. I think I would be lng death if I lived in a flat. Well, we’ve actually pondered the down-sizing/condo idea, Gwen, but I really can’t deal with that at all … maybe later, but not now! I loved this post. It encourages all of us to get outside and like what we see. It’s way too easy to hit Facebook and Pinterest to LIKE and REPIN! Capturing your small moments of beauty has inspired me today. We planted two Palo Verdes in our backyard a few months ago and I’m thrilled to see their yellow blooms. Hi, Lori, as small moments go I thought mine were pretty good — and they inspired me as well … or at least got me off the couch … Sorry I missed you at Destination Style! I Like, I Like, I Like. Thanks for reminding us that it’s the little things in life that we need to appreciate. The big things are too far and in between! 1. I had a little round cactus that bloomed the most beautiful flowers this week. I was so amazed by it that I took it to work to show my co-workers. Kind of like show and tell when we were kids. 2. I like that the Fichus tree that I thought I killed is starting to bloom again. And, last but not least, 3. My oldest grandson turned 15 yesterday and I like that people still can’t believe that I have a 15 year old grandson. Okay, I have to admit, this was hard. All I have to do is look outside and see so many things that I like, especially my new turtle enclosure, which is a wonderful oasis for Ana and Nina with aloe and cacti and gnomes. But, to find three things that stood out this week was hard! Before I end, (I didn’t mean to write a book on your blog!) I’m jealous that you got to see a birds nest with baby chicks. Anyone who knows me knows that I’m the bird woman. Lord knows I spend enough money to keep these wild little darlings fed. But I have never seen a nest. I know that they’re there, I can hear them, but I can’t see them. Love to you, Paul and pooches. I miss all of you tremendously. I think it’s time for drinks on the deck! Yes, drinks on the deck. I’ll text you some dates.